We have always had a strange love-hate relationship with wetlands. We may wax poetic about the moss-draped cypress trees in the moonlight, and thrill to the sight of a huge alligator slithering off the banks of the bayou. But at the same time, we also fear the dark, impenetrable reaches of the swamp, and curse the boiling clouds of mosquitoes that hang over the water. "Bad vapors" drift out of the swamp, a miasma that sickens those who live nearby. Before the advent of modern medicine, residents believed that these “vapors” could literally make you sick. Early settlers in New Orleans often awoke to the sound of cannons being fired in the vicinity of Canal Street, in the hopes that their sulfurous smoke would cleanse the air and prevent “mal - aria” and other diseases. But wetlands are economically and ecologically valuable in many ways. Wetlands support an abundance of life. Many plants, like cypress and tupelo trees, are specifically adapted to wetland habitats. There are relatively few vertebrates, however, that can survive in this habitat, although several species spend at least part of their lives in swamps. Some fish, like gar and bowfin, are permanent swamp residents. The most common species in stillwater swamps are fish that can gulp oxygen by sticking their heads out of the water, fish like the mosquitofish (Gambusia), and fish that can otherwise tolerate low oxygen levels. Many other species of fish use the swamp as a nursery for juvenile fish, or move into swamps to feed during periods of high water levels. Unlike other vertebrates, reptiles and amphibians are superbly adapted for life in the swamp. Alligators, cottonmouths and other snakes, lizards like the skink, and lots and lots of frogs live in the swamp. Other mammals that do well in swamps include beaver, otter, muskrat, and nutria. Nutria do so well, that because of nutria the cypress swamp ecosystem might vanish forever. Nutria are large rodents imported from South America by Mr. McIlhenny, the maker of Tabasco Sauce. He thought they could be developed into an inexpensive source of fur. Nutria fur has never been very popular, much less so today. At 50 cents or less a pelt, it's just not worth trapping them. So the population, in the absence of any native predators, quickly overwhelmed the less competitive muskrat, and took over the Louisiana swamps. A park the size of Jean Lafitte may contain several hundred thousand of the hungry rodents, and they have a special fondness for the tender young buds of baby cypress trees. Because of their appetite, they may prevent the cypress trees from regenerating, and when the existing trees die out, the swamps will disappear. Invertebrates do much better in the swamp than vertebrates. Oligochaete worms, clams, snails, shrimp, insects, and crawfish are among the large community of annelids, molluscs, and arthropods that live in swamps. The basis of the invertebrate food chain in the swamp is the detritus, or leaf litter that covers the floor of the swamp. This litter supports a thriving community of detritivores, organisms that feed on detritus, particles of dead and decaying organic matter. Our ignorance of their true value is reflected in the statistics of their destruction. In America, over half of our native wetlands are gone. From around 220 million acres in "the lower 48" in colonial times, we have reduced wetlands to about 104 million acres, a 53% loss. Alaska is one of the only states that retains much of its wetlands, adding 170 million acres to the U.S. total. It is notoriously difficult to define what a wetland really is, a difficulty that has made good legislation to protect wetlands hard to enact, and equally hard to enforce. In the broadest sense of the word, wetlands are areas that are covered by standing shallow water for at least part of the year. The water may not even be visible most of the time, although the soil may be saturated just below the surface. Beyond these simple guidelines, things get very fuzzy. We normally rely on "indicator species", species that are characteristic of a particular type of habitat, to determine the type of ecosystem we are studying. But there are few reliable indicator species for wetlands. Many of the same plants and animals can be found in many other types of habitats. The variety of sizes and types of wetlands is incredible. There are bogs, bottomlands, fens, marshes, mires, moors, muskeg, peatlands, playa, pothole marshes, reedswamps, sloughs, swamps, wet meadows, and wet prairies. In our area, the most common types of wetlands are marshes and swamps. The most obvious difference between a marsh and a swamp is that marshes lack trees, whereas swamps can be heavily forested. 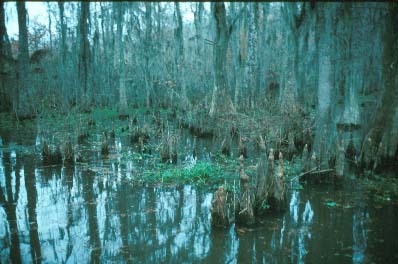 In southern swamps, the two dominant trees are Bald Cypress (Taxodium distichum), a gymnosperm, and Water Tupelo (Nyssa aquatica), an angiosperm. 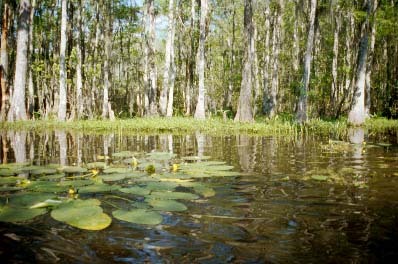 These swamps are often referred to as cypress-tupelo swamps. Other common trees in these "southern deepwater swamps", as they are also called, include Red Maple (Acer rubrum), and Black Willow (Salix nigra). 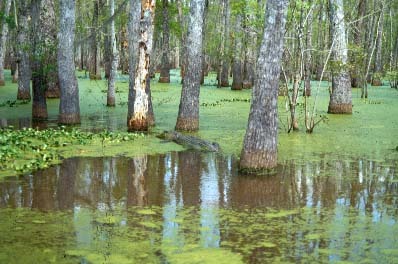 Cypress-Tupelo swamps are flooded year round, and only dry out during the most severe droughts. Permanently waterlogged soil are relatively poor in oxygen, which makes swamps a very difficult place for plants to grow in. Normal soils are very porous, and these pores are usually filled with oxygen. But in waterlogged soils, water replaces the air in these pores, and the soils become anaerobic. This drastically changes soil chemistry, shifting the balance from an oxidizing environment to a reducing environment. The reducing environment affects normal respiration in the roots of the plant, and interferes with the root's ability to take up certain nutrients. The reducing environment also creates sulfides, like hydrogen sulfides, and ferrous ions of iron, both of which are toxic to plants. Swamp species can tolerate high levels of these toxic chemicals. The waterlogged soils also make it hard for plants, especially large trees, to remain upright. Both cypress and tupelo trees have adapted to the challenge of this waterlogged environment in many ways. The similarity of their solutions shows convergent evolution. Both cypress and tupelo trees, for example, have swollen bases, which may help in aeration of the trunk tissue, and add stability to the tree's uncertain footing in the muddy soil. Cypress "knees" may also help keep the cypress tree upright, providing a broad and heavy counterweight at the base of the tree. The tissue structure of the wood inside the cypress knees suggests that it might have an additional function. Up to 60% of the stem and root tissue is aerenchyma, tissue with a lot of air spaces for gas exchange. Up to 60% of the body of the plant can consist of pore spaces. Tupelo trees may have one or two knees, but cypress trees can have many, and they can grow up to 10-12 feet high. These knees are only produced if the tree grows underwater. To help the roots maintain normal respiration, Cypress trees transport oxygen down to the roots, and cypress and tupelo may discharge oxygen out of the root and into the soil, to create a thin boundary layer of oxygenated soil around the roots. Cypress is not a good competitor with other tree species in dryer habitats. Cypress seedlings grow more slowly, so their faster-growing competitors shade them out. This may be why cypress has occupied a niche where other species cannot do well. In the wetland habitat, it is cypress that is the better competitor. Ironically, although both cypress trees and tupelo trees grow very well in standing water, neither species can germinate underwater. Their seeds need dry, oxygenated soil to germinate properly. Cypress and tupelo, therefore, can't regenerate unless the swamp dries up. Thus cypress and tupelo tend to form even-aged stands, because they all germinated at about the same time. Cypress swamps are extremely productive (NPP = 1,120 g/m-2/yr-1 or higher), but their productivity depends to a large degree on the input of nutrients. Riverine swamps, like those lining the Pearl River between Louisiana and Mississippi, are the most productive, because the constant flow of water carries fresh nutrients through the system. Stagnant swamps, lacking this constant nutrient flow, are less productive, reaching about the same productivity level (on average) as a temperate deciduous forest. The decomposition of leaf litter is slow in such "stillwater swamps". There is relatively little oxygen in the soil and adjacent leaf litter, and cypress needles, like the needles of other gymnosperms, decompose very slowly. Decomposition is further slowed by the overall reducing chemistry of the swamp floor. The water becomes darkly stained with tannic acid and other organic acids, giving it a characteristic "tea-colored" look. This dark color reduces the intensity of sunlight available for photosynthesis, and so reduces primary productivity in stagnant swamps. The gradual accumulation of partially decomposed leaf litter builds up into a thick layer of organic peat. During periods of drought, this peat can catch fire, and it makes an excellent, if smoky, fuel (British Isles mine sphagnum peat). Peat fires burn slowly, and can smolder on for several weeks. Fires are rare in the drier swamps, contrary to what you might think. Periodic floods in drier swamps wash away the leaf litter, and prevents the accumulation of a thick blanket of fuel. In the long run, fire helps maintain the cypress swamps, by preventing secondary succession towards a moist hardwood forest. Wind is another important force of disturbance in the swamp. Hurricanes and wind storms can cause a great deal of damage. It's much easier to topple a tree that is rooted only in mud. But mankind has become the biggest source of disturbance in the swamp. Most of our great southern swamps have been heavily logged at one time or another. The few remnants that have survived in places like Corkscrew Swamp, an Audubon sanctuary, show us how awesome these swamps must once have been. Some are over 700 years old! At one time, much of Louisiana must have been covered by these titanic trees. Nowadays, you rarely find a cypress tree more than about 200 years old. You can still see a few gigantic cypress stumps when you visit Jean Lafitte Park. Where did all this wood go? Most of it went into constructing lavish ante-bellum homes. A great deal of it went into making wooden boxes. Cypress wood has a well-deserved reputation for being resistant to decay. But the wood that is resistant is the central "heartwood". Most of the cypress lumber sold today, because it comes from much younger trees, is mainly "sapwood", which is no more resistant to decay than the wood of any other species. But the original cypress heartwood was truly wonderful stuff. When Henry Ford decided to stuff the seats of his Model-T's with Spanish Moss, he was pulling the moss over the eyes of his Louisiana suppliers. What he was really after was the cypress wood used to build the crates in which the moss was shipped. This wood was perfect for the wooden door panels and dashboards in his Fords, and he got it for nothing by buying the Spanish Moss. So the wonderful properties of cypress wood hastened the destruction of the vast southern swamps. But swamps do return after logging, if they are not further molested. Only water-tolerant trees can thrive in the wetland environment, so they will quickly recolonize the disturbed site and do well in the absence of serious competition, provided that the swamp is not drained after it is logged. We have had a very drastic effect on our freshwater swamps by draining them, by introducing exotic species, and by dumping our toxic wastes in them. But a few people, like the Cajuns of Louisiana, have learned to live in wetlands. Cajun culture at its best mines the rich biological harvest of the swamp, and lives in harmony with its natural cycles. The Seminole Indians in southern Florida are equally at home in the swamps and marshes. Because they were able to survive in the deepest recesses of the Florida swamps, the Seminoles become the only Native American tribe that was never captured or conquered. But with the exception of a few Cajuns and Seminoles, man, like the raccoon, comes to the swamp mostly as a visitor.